Samsung this month has started to take pre-orders on its first commercial 8K UHDTV, the Q900, which sports a 7680×4320 resolution. 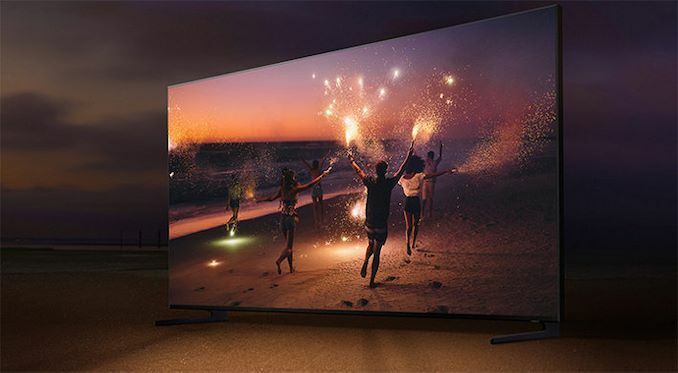 Besides the sheer number of pixels that the Samsung Q900-series UHDTV can display, the family features a plethora of premium technologies from the manufacturer, including QLED FALD-like backlighting, a proprietary 8K upscaling technology, support for a varity of HDR formats, and so on. The price per unit? Well, it is on par with a new Ford Fiesta in the U.S.
Samsung’s Q900-series 8K UHDTV lineup will include 65, 75, 82, and 85 inch models. The first product that the manufacturer plans to make available later this month is the flagship 85-inch (Q85Q900RA) SKU aimed at the most demanding users who are concerned about the quality and experience in the first place. 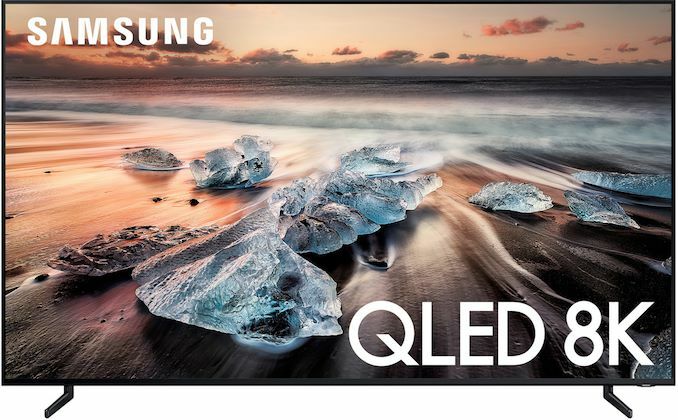 Samsung's Q900RA UHDTVs are based on the company’s panels, which are backed by a quantum dot-enhanced LED backlight that is also capable of FALD-like operation, which Samsung dubs Direct Full Array Elite technology. 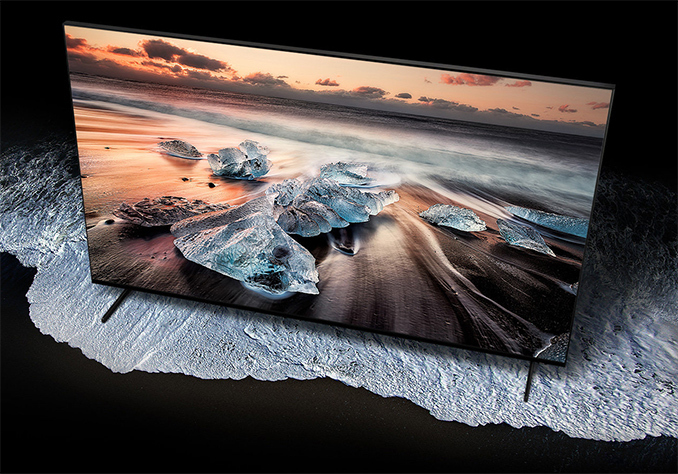 The televisions feature a peak brightness of 4000 nits, which is the maximum brightness at which HDR content is mastered today. Speaking of HDR, the Q900-series officially supports HDR10, HDR10+, and HLG formats, but not Dolby Vision (at least for now). As for color gamut, the Q900-series can reproduce 100% of the DCI-P3 space. Serving as the brains of Samsung’s Q900RA televisions is the company’s Quantum Processor 8K, which is responsible for all decoding, upscaling, and other operations. One of the features of the SoC that Samsung is especially proud of is its proprietary 8K AI Upscaling technology, which is designed to enhance the quality of digital content to panel’s native resolution (does not work with PCs, games, analogue content, etc.). The only thing that Samsung explains about the tech is that it uses “AI-based formulas” for “intelligent upscaling”. The SoC is also apparently able to interpolate content to 240 FPS. When it comes to audio output capabilities, Samsung’s 85-inch Q900RA UHDTV is equipped with a 60-W 4.2-channel audio subsystem. Moving on to connectivity. Like all ultra-premium UHDTVs from Samsung, the Q900-series uses the company’s optical One Invisible Connection to the One Connect Box, which has all the physical inputs. In the case of the Q900, the box has four HDMI headers, three USB ports, and one LAN connector. In addition, the Q900-series supports 802.11ac Wi-Fi and Bluetooth. Samsung’s 85-inch Q900RA QLED Smart UHD TV (QN85Q900RAFXZA) can be pre-ordered now for $14,999.99 (by contrast, the Fiesta starts at $14,260). The manufacturer will start shipments of the product on the last week of October, which starts on the 28th.
" including QLED FALD-like backlighting"